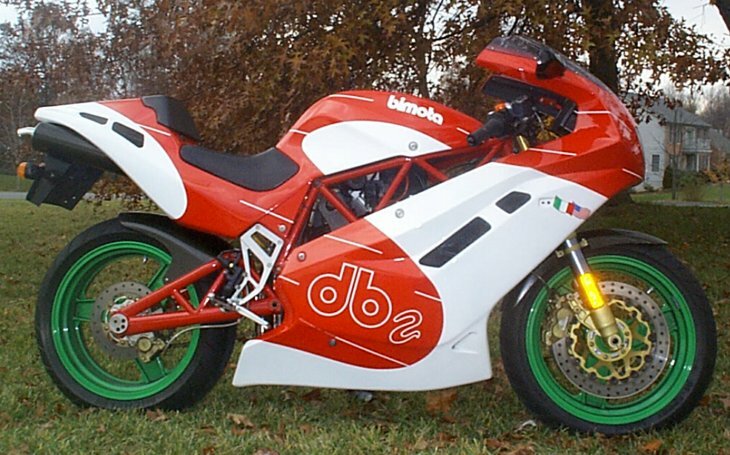 The purchase of my 1993 Bimota Db2 was pure chance. I bought a new 1982 Kawasaki GPZ550Z within a couple of months of arriving in the USA from England. I still had the GPZ550 in 1993, but had pretty much given up street riding from 1989. So the GPZ550 sat neglected in my garage for about 4 years. An old riding buddy called one Saturday morning, from England, to tell me all about his new Ducati 900SS that he bought a month earlier. Twenty minutes on the phone and I knew I had to get one. I dug out the Yellow Pages, this was a long time before the Internet, and saw a listing for Battley's and it stated they sold Ducati's. At that time, I lived two miles from Battley's, had driven by several times, but I thought they were a Harley Davidson dealership, so I had never stopped and gone in. That Saturday afternoon I walked into Battley's with my wife and two year old Son and was shocked to see not only a few Ducati's but also three Bimota's. I'd lusted over owning a Bimota since my early biking days in England. 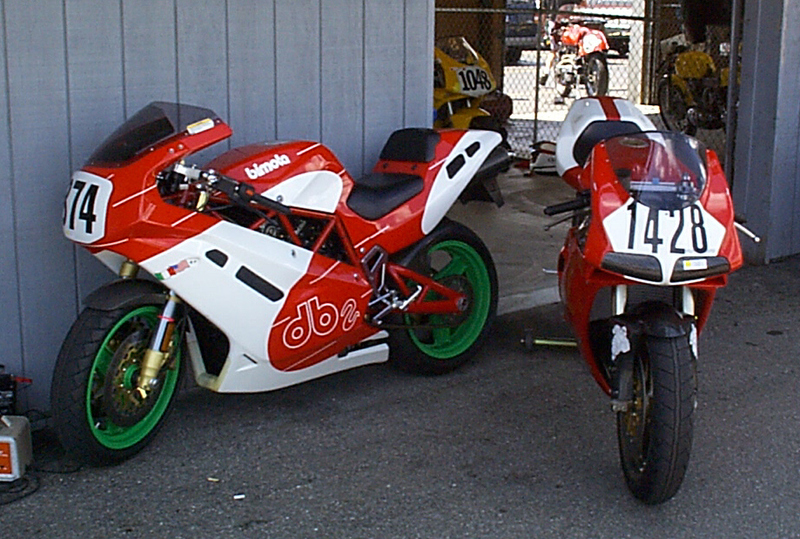 Up to this point I had only seen one Bimota in the flesh and here sat three, a YB10, Tesi and a DB2. 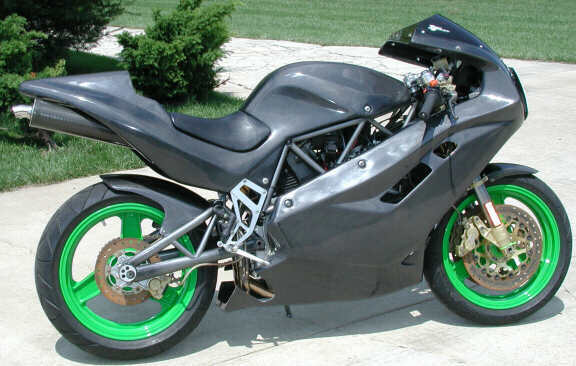 Battley's had four unsold Ducati's an 851, 888 and two 900SS. I honestly had no idea what I was looking at, I was so out of touch with the current sports bikes, their capabilities and specifications. After talking with Alan, the salesman, and Tom Buzas, as much as I wanted the DB2 and the wife told be to buy it, I settled on the idea of owning one of the 900SS's. I didn't have cash and I don't know why I didn't discuss financing the bike, but I left with the knowledge that a 900SS would be mine within a couple of weeks. Monday morning, I walked into my bank and applied for an equity loan. About eight days later I was back at the bank getting my equity loans checks. I drove straight from the bank to Battleys to buy my bike. I walked over to Alan, bike smile on my face, "I've come to buy my 900SS", then Alan informed me they had sold both 900SS's and the 851, I was gutted... and left. Telling the story to my wife later that evening, she said, "I know you really wanted the Bimota, so now you have no excuse to not buy it". Tom called me and asked if I wanted to take the DB2 for a test ride and the next day I did. 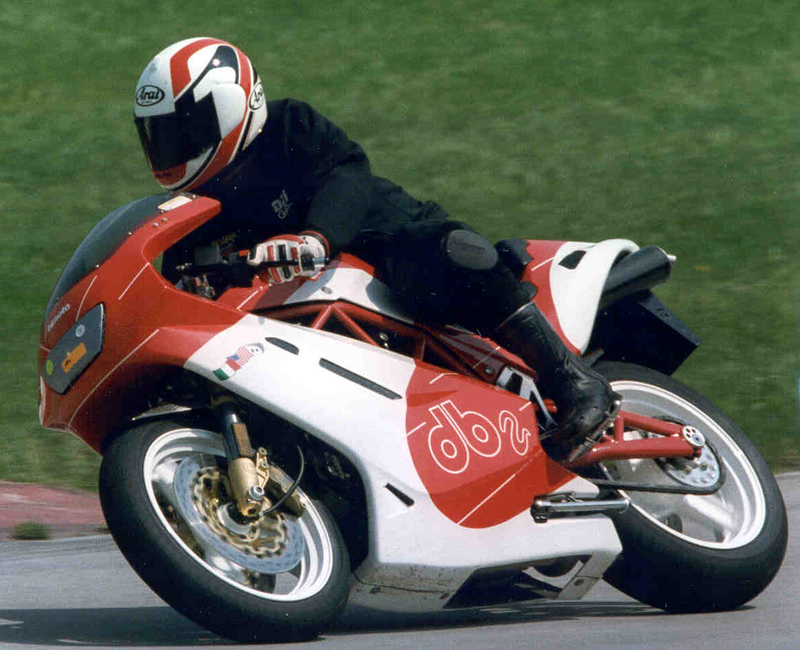 Two days later I owned my Bimota Db2. I rode for much of the remainder of 1994 by myself, I hadn't met the other guys that were soon to tbe the founding members of MAD. The bike had a couple of major problems, first the paint on the frame started flaking, so the frame was sent out to be powder coated. The second problem was that the bike ran like a bag of crap, it wouldn't pull past 7000rpm and spluttered quite often between 4000 and 6500rpm. After discussions with Tom Buzas, we figured it would get sorted out when Battleys installed their dyno, over the 1994/5 winter. 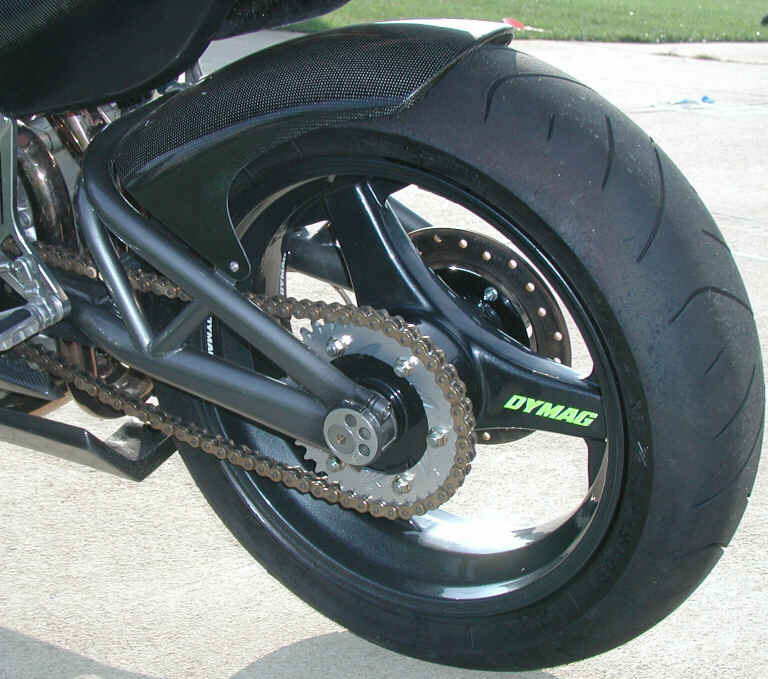 At the Dyno session, my bike was used as the guinea pig to train Chris Sanders, the Battleys tech, and to come up with the Dynojet Db2 package. 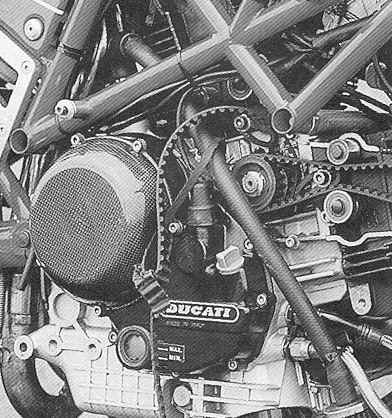 We found, for some unknown reason, Bimota had changed the needle and jets in the carbs from the stock 900SS setup and the intake on the airbox was a small 1" hole. So we swapped the carb settings back to the 900SS setup and removed the nose of the airbox ad went from 67rwhp to 73rwhp and a super smooth torque and HP curve. At this time of dynojet testing, this was where I met Mike Cecchini and John Moss, who were also bringing their respective bikes in to play on the dyno. 1995 I started riding with the group that would eventually morph into MAD. I did my first DOCC track day at Mid Ohio with Mike Cecchini and was hooked. We had the privilege of having Dave Sadowski and Tom Kipp as guest instructors. I got hooked up, one on one, with Dave Sadowski for several sessions and he paid me one of the biggest compliments of my riding career, he told me I was quick enough to go pro AMA racing at the national level. I was gob smacked, this was my first time on the track. Another year of riding with the group and I was seriously out powered on my 73rwhp bike compared to the bikes I was riding with. I made the mistake of reading an article by Peter Egan talking about the mods he had done to his 900SS and the only guy he would trust to do this was Greg Rammel in Detroit. After three calls to Greg, who was a regular DOCC guy, he agreed to update my engine in search of more power. Mike Cecchini rode with me up to Detroit to pick it up. Greg estimated, by his seat of the pants dyno, that the bike had to be making about 90rwhp. After about a month of gentle break in for the new pistons and rings, I put it on the Battley dyno, I was very disappointed when it only made 80rwhp. We thought the problem may have been the DB2 proprietary exhaust, so Battleys was kind enough to let me try an OEM Ducati 900SS exhaust as well as a couple of different slip on’s. None of these made any significant difference. At Grattan, later in the year, Greg was also perplexed and had another customers DB2 with pretty much the same mods as mine. There was a guy at the track with a dyno, so we did back to back runs of my bike and this other Db2. Mine made the same rwhp as it did at Battley’s and the other DB2 made around 89rwhp. Still frustrated, I gave my bike to Tony Foster from PCS Daytona, who also had experience with hopping up 900SS’s and Db2’s. Tony found 3 of my 4 valves were not sealing properly. After regrinding these, the bike dyon’ed at 88rwhp. I was finally a happy camper. In 1997, with the bike finally sorted, a bunch of us attended the DOCC rally at Grattan. This was a four day event and we had the pleasure of having Sport Rider and Cycle World rider/writers attending the event. The second session of the first day, the rear cylinder belt snapped and the bike was done. 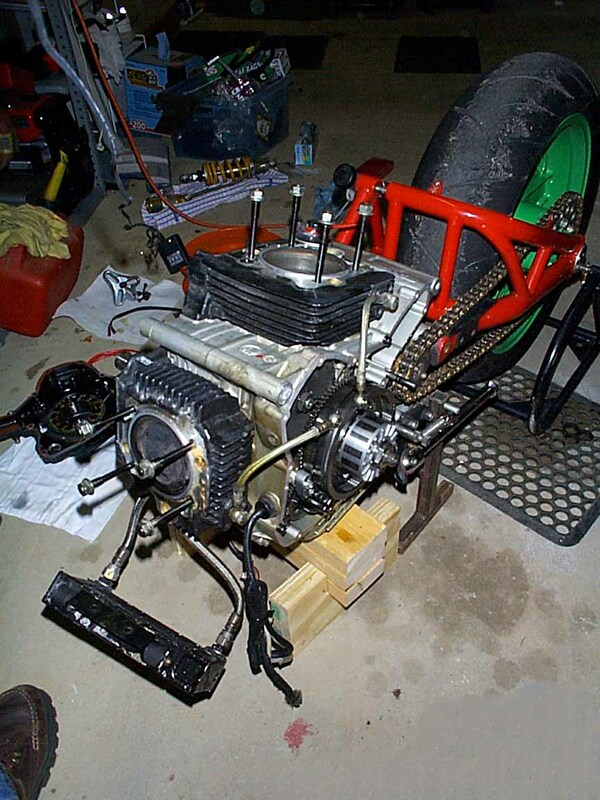 Tony Foster was at the event and let me ride one of his 748’s for the remainder of the event and then took my bike back down to Daytona to put a new piston, rear cylinder valves and the stock cams back in, the rear cylinder Vee Two cam got messed up. 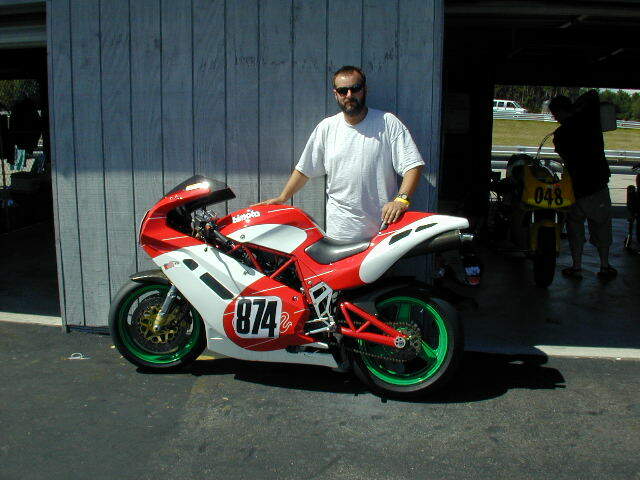 In 2000, at the DOCC event at Mosport, the most dreaded moment finally happened, I low sided the bike at the top of turn two, the bike suffered cosmetic damage to the fairing and tail section as well as the usual foot peg and handlebar stuff. I subsequently bought some Sebimoto carbon fiber race bodywork and a set of Dymag wheels. In race trim, with the Dymag Wheels and Sebimoto bodywork, I had the bike weighed on certified AMA scales and it came in at 354lbs with a full tank of gas. In street trim with the OEM wheels, it weighed 408lbs with a full tank of gas.